Our homeowner wanted a breezy and bug-free retreat for relaxing and enjoying the views of their large property. We created a space that matches the home and provides ample space for an outdoor living room, while also building out a large, enclosed storage area on the back of the structure. We decked the roof with a decorative T1-11 and used #1 grade framing material so we could leave the rafters exposed and painted. The screened wall involves a 30” knee wall and “Real Post” along with hand-stretched screen trimmed out with hardieplank. 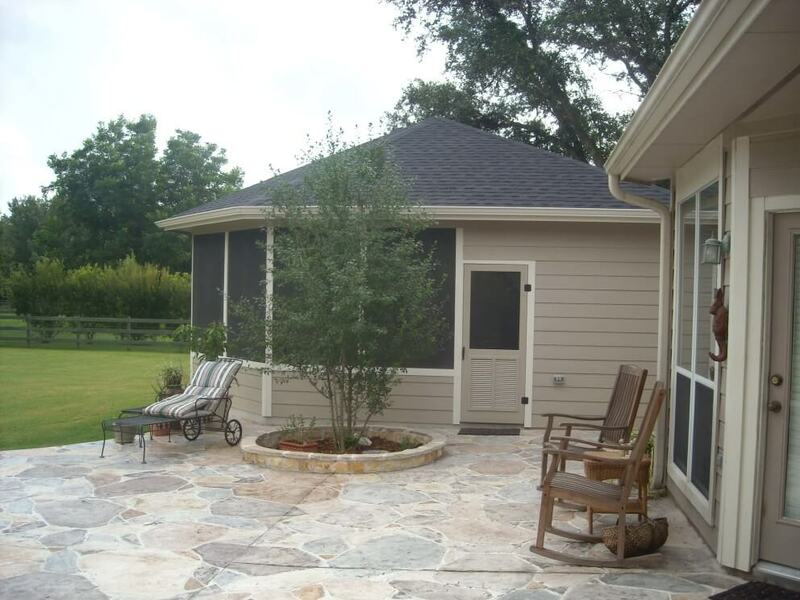 The patio (inside & out) is a stamped concrete overlay in a flagstone pattern. The large, uncovered area of the patio includes a fire pit. With over an acre on this lot, there was plenty of room for a large freestanding screened room and patio with fire pit. We were very pleased with Texas Custom Patios and how our primary contact, Ryan, approached the job. He was very polished and professional and as issues surfaced during the project he was quick to deliver a solid solution. Well worth the investment. We are very pleased with the outcome of this patio and are happy to be a reference to anyone with questions.